Noted carp expert Dave Pickering and the 32 pound carp he caught last week using a combination of maize and a pink artificial piece of corn. Capt. BJ Silvia of Flippin’ Out Charters with the 36 pound striped bass he caught when fishing with live pogies in the East Passage. Jay Anctil of Coventry caught striped bass to 25 pounds with his fishing partner Mike Swain in the Conimicut Light, Warwick area this weekend. 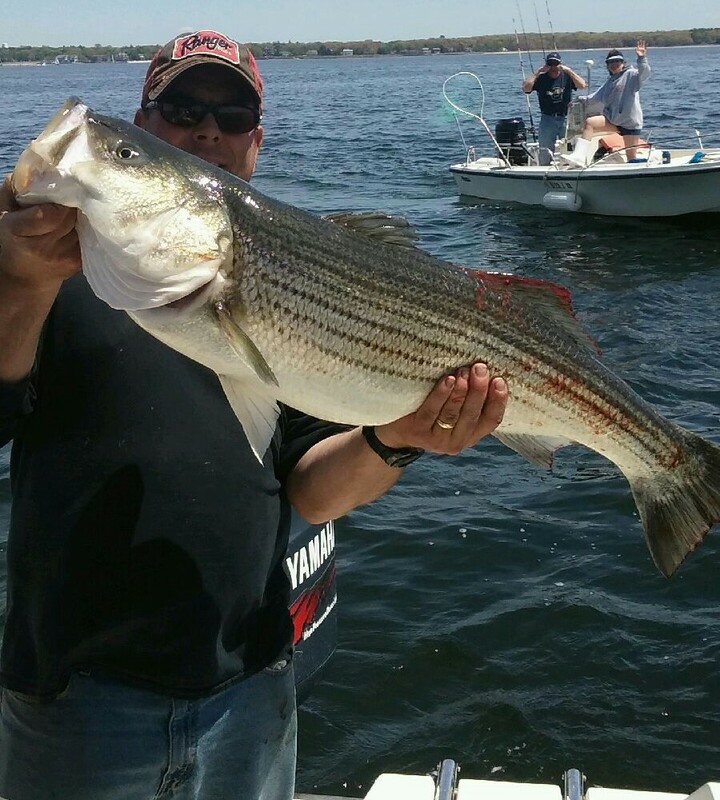 Angler Mike Swain of Coventry with the striped bass he caught using live pogies this weekend. 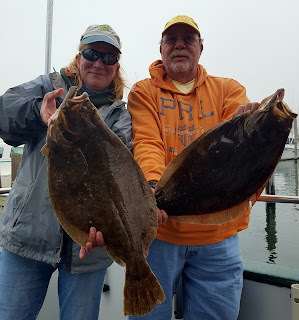 Diane Valerien of Coventry (7.3 pound fluke) and Barry Gootkind of Narragansett (6.3 pound fluke) caught last week on the Seven B's party boat. RISAA aims to hook kids on fishing with their new pilot project... a youth fishing camp. OK, so there are all types of camps, sports, dance, even cooking camps and now there is a fishing camp in Rhode Island. 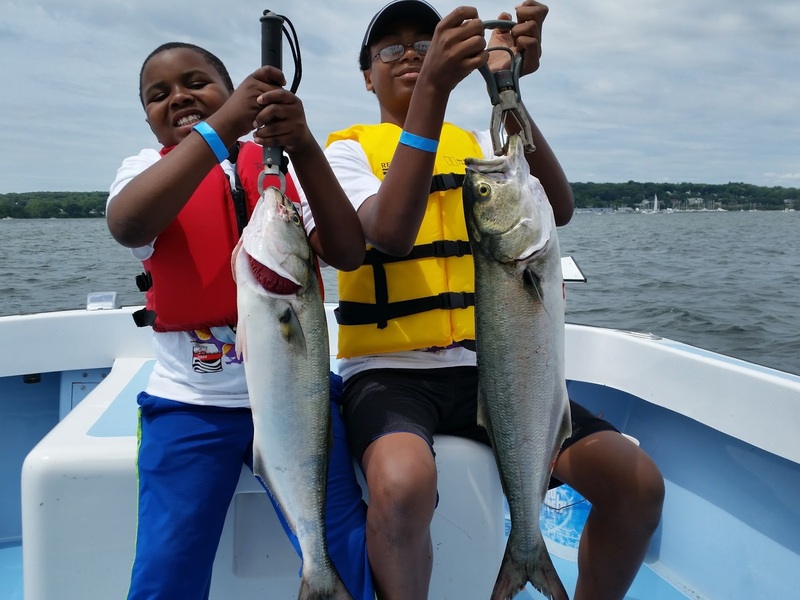 The Rhode Island Saltwater Anglers Association (RISAA) is holding a pilot fishing camp at Rocky Point Park, Warwick, Tuesday, June 28 to Thursday, June 30 for children 7 to 14 years old. A lot goes on when you fish. It appeals to our sense of adventure and teaches us patience, it is one of those activities where science and art converge, it teaches us to be good stewards of the environment and it allows us to build a lifetime of memories and friendships with those we fish with. For now RISAA’s piolet fishing camp is taking 40 children on a first- come, first- served basis and developing a waiting list. Children will be split into two groups, 7 to 10 and 11 to 14 year old age groups. The same children attend all three days. There is no cost for children to participate, however, parents must complete and sign all participation forms, provide their child with proper attire for an outdoor fishing camp and weather conditions. Parents must provide transportation for children each day. The fishing camp is sponsored by the RI Saltwater Anglers Foundation and partners include the RI Department of Environmental Management, the City of Warwick, the Coast Guard Auxiliary and Brewers Marina. There is limited space available, sign up this week by calling the RI Saltwater Anglers Association office at 401.826.2121. 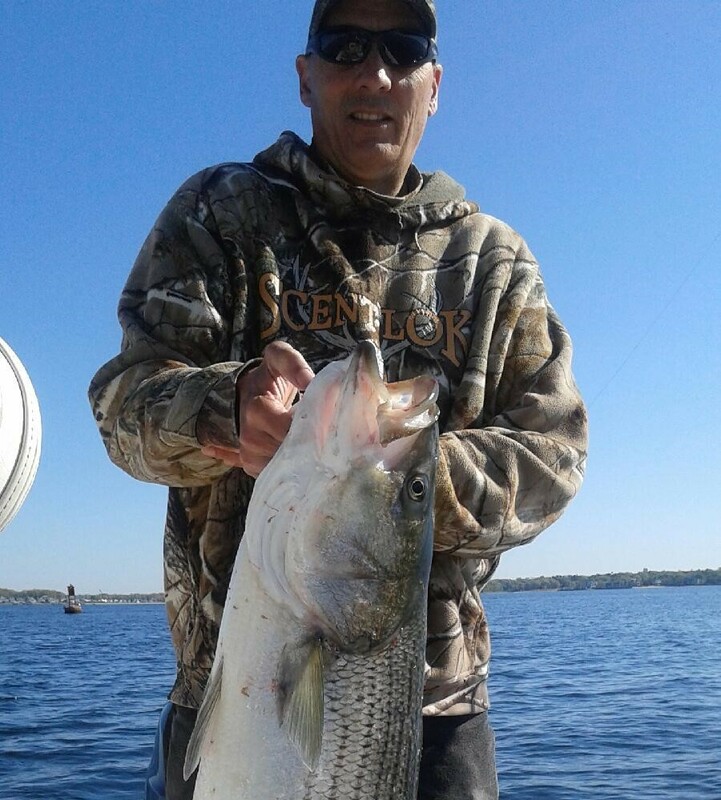 The striped bass fishing season in underway and there are some large bass being caught in the East Passage of Narragansett Bay. Striped bass have to be at least 28 inches to take them and the limit is one fish/person/day. My all-time favorite way to catch a striped bass is using a surface lure or plug. There is nothing like seeing a striped bass explode on the surface to attack your plug. This method is particularly good to use when conditions call for you to bring attention to the surface. The plugs can be pulled, swayed and skipped across the water surface making a splash when they move and a wake (in V form) much like a boat. Some lures add additional sound by making the lure rattle as it is pulled across the surface. I have found this method to work particularly well in the spring and fall when the water is warmer on the surface and the bass are feeding in the upper portions of the water column and they are not down deep where the water tends to be cooler. Fishing with live (known as live-lining) or dead cut up Atlantic menhaden (known as chunking) is most definitely a fun way to fish for striped bass. Anglers chunk with fresh or frozen menhaden. You can anchor (and chum), drift fish or fish the moving bait schools with chunks. Some anglers like to use a weight (often with a sliding clip on their line) to get the bait down when the striped bass are feeding at the bottom. Many anglers catch their bait by snagging the live Atlantic menhaden with a weighted treble hook and others net them. To live-line menhaden, hook the live bait through the bridge of their nose, find a school of fish and put the live menhaden into the school or near it and let it swim. This method is used most often when the Atlantic menhaden are running strong, particularly in the middle and upper portions of East Passage of the Bay. The shipping channel in the East Passage of the Bay acts as a fish highway carrying bait and striped bass all the way through Providence to Pawtucket. I have had great success in the Bay using lead line weighted with two or three ounces of lead between the line and a five foot fluorocarbon leader. I find that bubblegum or red colored tubes work best in the spring (the tube hook is tipped with clam worm). The idea of added weight is to get the line down to where the fish are. Tube and worm trolling has also been a successful technique for fishing the ocean, particularly the Southwest side of Block Island, using 300 ft. of wire line in 35 to 45 feet of water, amber colored tubes seem to work best there. Summer flounder (fluke) fishing is really starting to pick up. Matt Conti of Snug Harbor Marina said, “Fluke fishing is getting better every day with keeper fish (with a lot of shorts mixed in) being caught along the beaches in the Charlestown area but the best bite so far is on the West and Southwest sides of Block Island.” Diane Valerien of Coventry and Barry Gootkind of Narragansett caught fluke to over seven pounds fishing the Seven B's party boat last Friday. The Frances Fleet reports a good fluke bite with one customer limiting out last Friday and others returning home with three to five fish. 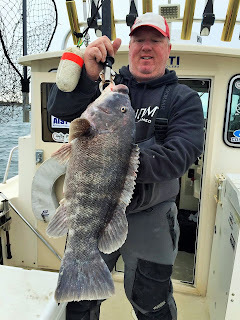 The tautog bite continues to be good for a spring season, fishing is spotty but there are some big fish being caught. 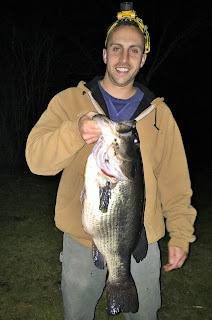 Night catch: Brandon Migliore and his 11.2 pound largemouth bass. If the state certifies the catch it will be a new Rhode Island record. All smiles: Brandon Migliore with his 11.2 pound record largemouth bass as his friend and fishing partner Matthew Sheldon looks on. Capt. BJ Silvia with an 11.5 pound tautog caught Sunday. On Tuesday the Rhode Island Department of Environmental Management (DEM) enacted a new regulation to help prevent the illegal harvest and sale of Atlantic striped bass. The new rule requires recreational anglers to clip the right pectoral fin of striped bass 34 inches or larger at the time of harvest. The new regulation was adopted with considerable public input to help prevent “stockpiling” – which occurs when fish are harvested on a day closed to commercial fishing and then offered for sale on an open day; they also address fish being illegally transported and sold in neighboring states. “Our local harvest supports the health of our families, economy and way of life. And protecting the viability of our stock and ensuring fish are legally harvested and sold are responsibilities we take very seriously. These new regulations are critical to supporting the continued vibrancy of the striped bass fishery, and I thank the Rhode Island Marine Fisheries Council for its leadership in engaging the public around this important topic and working to protect our state’s marine resources.” said DEM Director Janet Coit. Many recreational anglers are not happy with black sea bass total allowable catch limits, however, many are praising what will likely be the new recreational regulation here in RI this year. The minimum size will now be 15” with a three fish/person/day limit between June 15 and August 31, and a seven fish/person/day catch limit between September 1 and December 31. Both the Rhode Island Party & Charter Boat Association and the Rhode Island Saltwater Anglers Association agreed on this option at the last public hearing and it was recommended by the RI Marine Fisheries Council at their last meeting. “This bass hit when I had about 75% of my cast retrieved. I waited a bit before setting the hook as I have been setting it too early. I waited until I felt the weight, the rod bend and then set the hook. I just kept the pressure on the fish because I knew that if I let up the fish would be gone. It took about two minutes to land.” said Brandon Migliore of Sterling, CT (formerly of Coventry) about the record 11.2 pound largemouth bass he caught this weekend at Johnson’s Pond, Rhode Island. The 11.2 pound largemouth bass will be a new state record if the catch is certified and approved by the Department of Environmental Management (DEM). The 10.6 pound largemouth bass holding the record was caught in 1991 at Carbuncle Pond. On a national level, NOAA’s Fisheries has been increasing efforts to better support saltwater recreational fishing and recreational fisheries issues. In 2015, NOAA Fisheries published a National Saltwater Recreational Fisheries Policy and a National Saltwater Recreational Fisheries Implementation Plan. The policy highlighted six key principles intended to guide NOAA in considering the development and promotion of sustainable high quality saltwater recreational fisheries. Each region now has an implementation plan (visit www.fisheries.noaa.gov for a link to the Greater Atlantic Regional Implementation Plan as well as national and other regional plans). The recreational fisheries that NOAA manages include cod, haddock, many flounders, Atlantic bluefish, black sea bass, scup, striped bass, tautog, and weakfish. They also are responsible for the management of other recreationally caught and/or forage species such as Atlantic herring, Atlantic mackerel, squid, and butterfish. These species provide an important food source for recreationally sought-after fishes such as striped bass, tuna, and sharks. For more information, contact Moira Kelly, Greater Atlantic Regional Coordinator for recreational fisheries, at 978-281-9218 or email her at moira.kelly@noaa.gov. 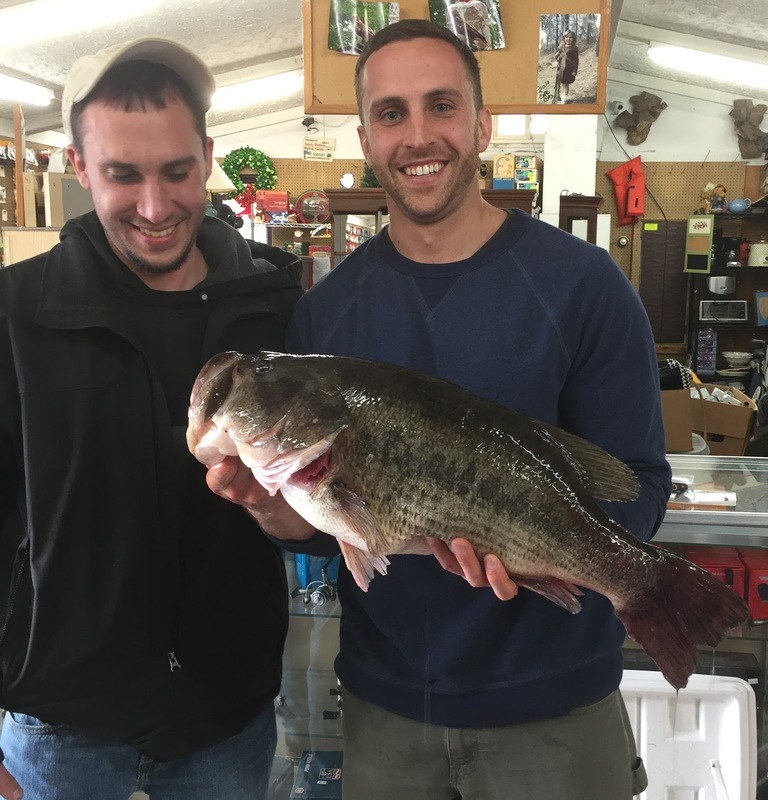 Freshwater fishing this week was topped-off with Brandon Migliore’s record 11.2 pound largemouth bass caught at Johnson’s Pond. Manny Macedo of Lucky Bait said, “The trout bite has been very, very good with night crawlers now the bait of choice. Anglers are catching fish at Melville Pond and Olney Pond, Lincoln Woods.” “Freshwater anglers are targeting bass and trout. I have sold about 20 dozen shiners toady and it’s only 10:30 a.m.” said John Littlefield of Archie’s Bait & Tackle. Tautog fishing is just starting to heat up with anglers catching shorts with some keepers mixed in. No major reports of people limiting out with their three fish, however, keeper fish are being caught. Many Macedo of Lucky Bait said, “It’s rocks and docks for tautog and customers are catching them at the Stone Bridge, Tiverton and Ohio Ledge in the East Passage of the Bay. Anglers are using worms, Asian and green crabs with some old timers using quahogs with success.” Elisa Cahill of Snug Harbor Marina said, “The commercial rod and reel fishermen are limiting out on tautog (ten fish) fishing in shallow water along the southern coastal shore using green crabs.” Capt. BJ Silvia of Flippin’ Out Charters landed an 11.5 pound tautog Sunday and said, “I let her go so you can catch her when she is 15 pounds.” “It’s hit or miss with tautog. One day the bite was good at Conimicut Light and the next the bite was off. They were catching a lot of small fish at the Wharf Tavern, Warren but they were at 6 to 8 inches.” said Littlefield of Archie’s Bait. Capt. 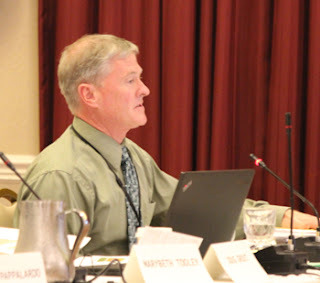 Frank Blount at a New England Fishery Management Council meeting. His term expires this year. Photo courtesy of Fishermen’s Voice. Capt. Dave Monti and Steve Brustein used sea clams to catch cod last fall off Block Island. 28 pound cod landed on the Frances Fleet this past weekend. Capt. Frank Blount, owner of the Frances Fleet, Narragansett, will be leaving the New England Fishery Management Council (NEFMC) this year after multiple terms of service as a councilperson. At last week’s NEFMC meeting in Mystic, CT Capt. Blount made a motion that was approved by the council. The motion was to “Move to request that the NEFMC ask the National Marine Fisheries Service (NOAA Fisheries) to provide information on the level of compliance with ground fish catch reporting by reconciling Vessel Trip Reports (VTRs) vs. SAFIS (fish dealer) reports.” In other words does harvester and dealer reports match, if they do not match there is non-compliance and there may be something afoot. The VTR and SAFIS reports were established as a check and balance to make sure fish processors and fishermen are reporting landings factually. I heard Frank make the motion and was overcome with a sense of pride to have such a great fisherman from Rhode Island represent us on the Council. Capt. Blount has also been an advocate for fishermen on the subject of cod fish being caught in local waters. He has claimed that VTR logbook data from fishermen indicates that there are far more cod fish in the waters south of Massachusetts compared to the official stock assessments coming from the National Marine Fisheries Service. Recent recreational fishing activity and data reports off Rhode Island over the past two years seem support this position. Congratulations Frank! You have done a great job serving Rhode Island, New England and the fish working on the New England Council. “A couple of years ago we wouldn’t be having this seminar on small boat cod fishing close to shore because there were no cod.” said Capt. BJ Silvia of Flippin’ Out Charters at a RI Saltwater Anglers Association seminar he and fishing partner Greg Vespe gave Monday night. The commercial cod fishery in New England has suffered major blows with recreational fishing north of Rhode Island being off too. In fact for a couple of years you could not take any cod from the Gulf of Maine, and this year recreational anglers are allowed to take one fish. 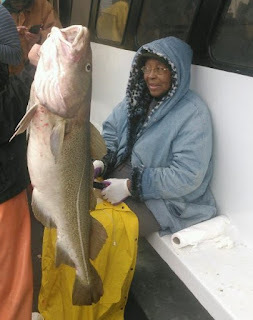 However, in Rhode Island we have quite a different story (10 fish/person/day with a 22” minimum size) with anglers catching multiple cod while tautog fishing this fall with some early reports that cod fish are mixed in with the tautog this spring too. The fall bite was so good that some were targeting cod close to shore off Newport and very close to Block Island at the East Fishing Grounds in addition to fishing in and around Cox’s Ledge. By no means do we have a robust recreational cod fishery, however, it does seem to be rebuilding here off Rhode Island. To avoid tangles and absorb shock when using braid line Greg Vespe suggests using a 20 foot, 50 pound monofilament leader. Avoid dog fish (sand sharks) by moving, sometimes just a bit further up on a ledge or a different spot entirely and switch to jigs rather than using bait. Bring plenty of bait… sea clams, crabs as well as squid so you can take advantage of scup, black sea bass, cod and tautog that may be in the area. “We have been on top of some huge black sea bass when fishing for tautog or cod but the bite only picks up when we put on some squid.” said Silvia. Target structure… ledges, mussel beds etc., however some of our best cod fishing has occurred where dolphins and whales are feeding. The Rhode Island Department of Environmental Management (DEM) is teaming up with the National Association of State Boating Law Administrators (NASBLA) to promote boating education. An informed and knowledgeable boat operator is much more likely to recognize hazardous conditions on the water and avoid a mishap. According to the U.S. Coast Guard, only 12 percent of deaths occurred on vessels operated by those with a boating education certificate; 77 percent of boating deaths occurred on vessels where the boat operator never received boating education instruction. Remaining boating courses include ‘About Boating Safety’ being offered on May 14, Cross Mills Public Library, 4417 Old Post Road, Charlestown and on June 18 at the Neighborhood Guild, 325 Columbia Street, Peacedale, RI. To register call (401) 789-9301, or for more information contact David Johnson at dgjdive1@verizon.net or call (401) 783-1170. DEM also offers an online boater education course. Participants must pass a proctored exam to receive certification. For more information on Rhode Island boating laws and boating education courses, visit www.dem.ri.gov . Forty-nine states and U.S. territories require proof of completion of a boating education course for operators of some powered vessels. In Rhode Island, successful completion of a boating safety course is required for all boaters born after January 1, 1986 who operate a boat with a motor greater than 10 horsepower; and for all operators, regardless of age, of personal watercraft. Newport Exhibition Group, owners and producers of the Newport International Boat Show, are accepting applications for the 2016 Newport For New Products (NFNP) Awards. Judged by a team of marine-industry experts, NFNP winners for best new powerboat, sailboat and multihull, best new navigation product, and best new product for boat operation, maintenance, and safety will be announced on Friday, September 16th at the Industry Awards/Press Breakfast. In addition, attendees present on opening day will have the opportunity to vote for their favorite new boat as part of the ‘People’s Choice Award’. The Newport International Boat Show will take place September 15-18, 2016 on the Newport Waterfront, America’s Cup Avenue, Newport, Rhode Island. The Show is one of the largest in-water shows in the country and with an assortment of boats of every type and style, plus a variety of accessories, equipment, electronics, gear and services for boaters. For more information and to purchase tickets, visit www.newportboatshow.com. 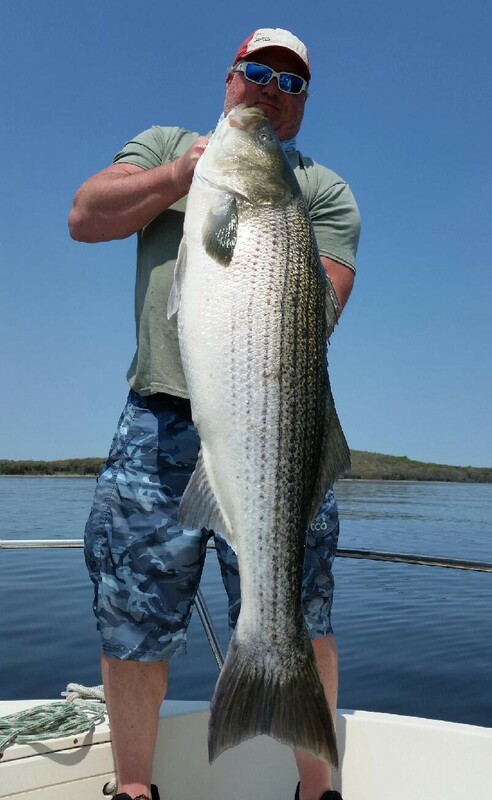 Striped bass fishing is exploding. “Customers are catching fish in the 30” to 40” range this week. It started last Thursday when a large amount of Atlantic menhaden arrived in the Pawcatuck River. Anglers are live lining and using chucked Atlantic menhaden as bait along with eels.” said Mike Wade of Watch Hill Outfitters, Westerly. Noted striper fly fisherman Ed Lombardo said, “We got into stripers last Thursday at Narrow River. The school of bass where small but still a lot of fun and so nice to feel that strike after a long winter! The tide was outgoing and at 5:30 p.m. and then changed to incoming. 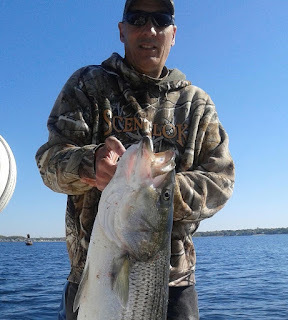 Small white over purple flies and all pink tide with craft fur worked well, size 1/0 .” Ken Ferrara of Ray’s Bait & Tackle, Warwick said, “School size bass are being caught in Greenwich Bay and in our coves. “ “We have a huge volume (1,000 of fish) of small school size striped bass in the six to twelve inch range at the Hurricane Barrier in the Providence River this week. One of my employees caught two 20 inch fish there this week. I predict we will have keepers in the Bay next week.” said Dave Henault of Ocean State Tackle, Providence. Freshwater fishing is excellent. Rhode Island DEM has restocked trout a second time in some locations. For a list of stocked and restocked water ways visit www.dem.ri.gov . “The State of RI did an outstanding job stocking ponds this year as all fishermen seem to be very happy. We have some customers that have been fishing Carolina Trout Pond and have done well. Anglers are starting to switch from hatchery bait types to natural baits such as night crawlers and spinner baits.” said Mike Wade of Watch Hill. Trout is not the only freshwater fish biting… “I have already weighed in more five plus pound bass than I did all of last year.” said Dave Henault of Ocean State.